About two years ago, I released a HTML5 game known as Doge Warrior, which is an action puzzle platformer where you control a muscular Doge mascot wondering around labyrinths and dungeons beneath a castle full of trapdoors puzzles and riddles. Today i checked the stats, and happy to see that it finally broke 200,000 views. 25 years ago when I was 8 , I played a retro PC game on my old 486 PC known as <Gods>, a classic platformer game created by Bitmap Brothers. This game had the best Pixel arts during that time, the graphics was so beautiful that I think it still looks pretty decent after almost 25 years today. This game had a very mysterious and dark atmosphere that can capture your imaginations. There are plenty of hidden trapdoors and secrets waiting to be unlocked and I spent a lot of time searching through each doors and walls. Inspired by this game, I have always wanted to recreate something similar (Mysterious labyrinth full of puzzles and trapdoors) , but with better controls, because this game although beautiful, the controls are not very smooth, and sometimes it can get very frustrating not able to jump properly over the platforms or ladders. During 2013 Christmas, I stumbled upon a subreddit known as Dogecoin on /r/dogecoin, there was so much hype about Dogecoin during that time, and everyone on the subreddit was so drunk and high about Doge memes and every once a while there will be someone contributing arts, drawing, games and etc on the forum..and suddenly I had this idea of creating a casual game based on Doge theme. I actually started of by making a Shooter game, known as "To The Moon", where you control a Rocket which can fire doge coins and you need to avoid collision with other altcoins. I finished the game in about 1 week and posted to /r/dogecoin. My post gained quite some upvotes which was what motivated me to do a follow up. My second Doge themed game was "Shiba Jump", which is a Doodle Jump kinda game, with a cute looking Shiba Inu dog as the main character. After these 2 casual games, I thought maybe I can do something more serious and can be played for a longer time, and thus, I started coding Dogewarrior, and after 5-6 months time, I managed to complete the game. 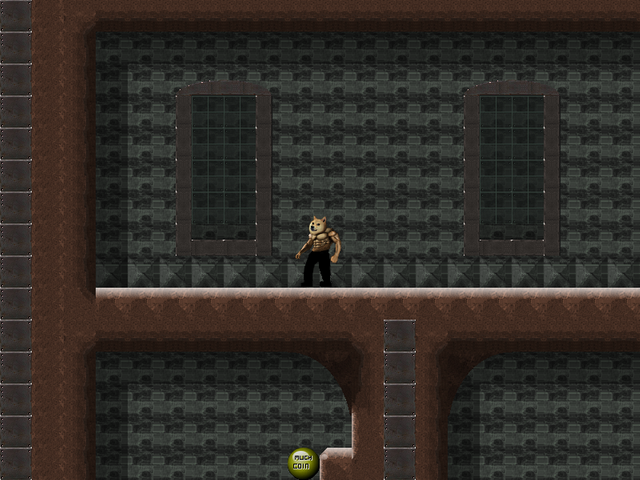 And I have also released more levels from time to time during my free time..
Doge Warrior Level 03: Futuristic theme. That's all for my indie game dev story . I hope you like it. Thanks. This post received a 2.4% upvote from @randowhale thanks to @fundurian! For more information, click here!